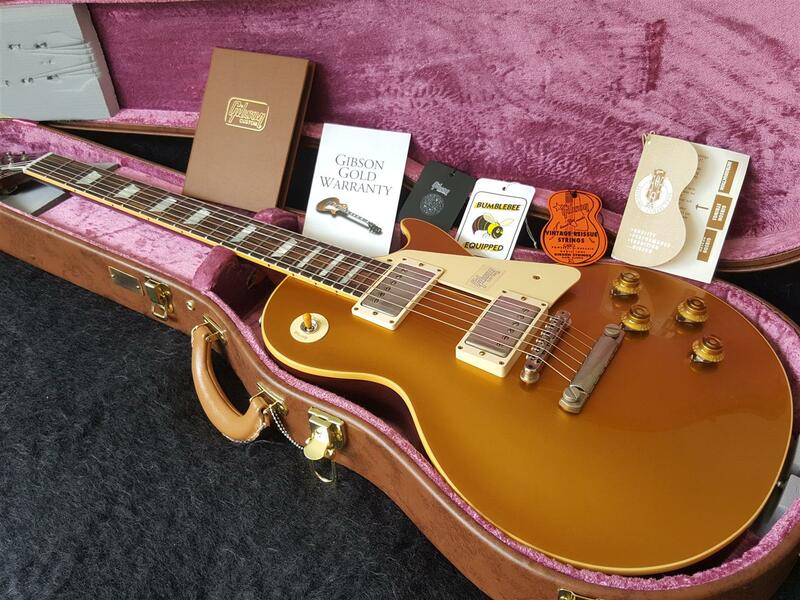 The Most Authentic '57 Les Paul Reissue To Date! Go to "About Store" below to contact us to discuss. Necks and fretboards are now attached using hide glue. Gibson Custom paid just as much attention to the Standard Historic 1957 Goldtop Les Paul's electronics as they did to its aesthetics. Beginning with vintage CTS potentiometers and bumble bee capacitors, every part of its internal signal path is designed to give you absolutely dead-on '57 Les Paul tone. Of course, it's next to impossible to find genuine '50s PAFs. The CustomBucker is the most historically accurate PAF copy ever. When early Les Pauls are discussed (and they are at great length), a big issue is always the neck profile. The earliest Les Pauls had big, fat necks made of mahogany. The neck was slimmed down a bit in 1959 and it finally evolved into what's known today as the SlimTaper neck in 1960. Some players love those huge old necks while others prefer the SlimTaper design. This Standard Historic 1957 Goldtop Les Paul has a bound mahogany neck with long neck tenon and the original chunky '50s rounded neck profile, which is historically accurate.